A few years ago when I lived in Boston, I took a bus trip to Amherst, Massachusetts. I had researched a literary walk and found a book at the public library called A Guide to Writers’ Homes in New England by Miriam Levine. 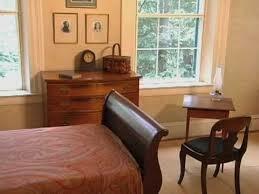 Emily Dickinson’s Homestead was on my list of authors’ homes that I planned to visit. 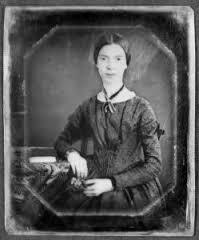 I had taken a college course about Emily Dickinson and I was interested in her life and her work. I took a Peter Pan bus and I let the melodious voice of Nat King Cole serenade me during the entire journey. I changed buses in Springfield, MA and took the second bus on into Amherst. When I arrived in Amherst, the bus let me off right across the street from Amherst College. There was a May Day celebration taking place on the college lawn and the students were decorating a maypole with flowers and ribbons. It was a pleasant scene. On another part of the lawn, there were tents set up and the League of Women Voters was having a book sale. I found a duplicate of a textbook that I had used when teaching American literature. I was delighted! I ate at a nearby Subway and walked a short distance to Emily’s home. I sat in her backyard where I saw her garden as I waited for the tour to begin. I later learned that she was interested in botany and liked to work in her garden. We were shown Emily’s personal library and it included books by authors such as Bronte, the Brownings and Shakespeare. When we moved towards the kitchen, Stacey said that Emily was a good cook. She cooked gingerbread and lowered it down in a basket to the awaiting children. We saw the basket sitting by her bedroom window later during the tour. One thing is clear. She was moved by the events around her and she had a voice. According to the tour guide, she could see a cemetery from her room and a number of her poems talked about death. She could see the processionals and was acutely aware of life’s mortality. This visit was well worth the trip and I will cherish its memory. After reading an article published in the Author Daily Discovery, I was inspired to write a post about bookstores and their importance in our lives. The article states that author James Patterson recently donated money to a number of independent bookstores in the UK and Ireland. More specifically, it says, “More than £130,000 has been allocated to 73 independent bookshops in the UK and Ireland in the first round of grants funded on this side of the Atlantic by author James Patterson (Shaffi, Sarah. 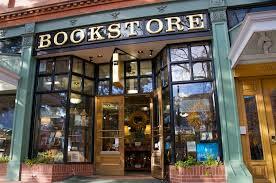 Patterson awards grants to 73 Indie bookshops, 9-25-14). They were impressed that the donations came from this side of the “pond” or the Atlantic. The goal is to help struggling bookstores that encourage children to read. “For the lucky 73 shops, the James Patterson money will make a real difference to how they reach children and encourage them to read” (Shaffi). I was reminded of several things as I thought about my own literary walk or journey. When a good, solid job could not be found during one phase of my life, I ended up working at Waldenbooks in Tennessee. This one job as a bookseller led to many wonderful experiences and exposure to a whole new world. My assigned sections were religion, self-help and romance. As Robert Frost wrote in his poem, “The Road Not Taken, ““I took the one less traveled by; and that has made all the difference.” Those three subject areas have become prevalent themes in my novellas. During my stint there, I had to read in order to be a top bookseller. I could not recommend a book that I had not read and simply say it was a good book. I needed to do a quick book talk to make the sale. Of course, I could not read everything, but I read a lot of new stuff, hot off the press. My mother and I read the new novels that I brought home from the store on loan. We had a reading jubilee on a regular basis! The little ladies would await the new editions of the Harlequin romances with anticipation. They would come with their little shopping bags waiting for them to be shelved. I watched as they checked the copyright page to make sure that it was the newest edition of a series. That was funny. But, they left as happy campers. Working at the bookstore was a rich experience. It was located in a mall and there were always fun activities going on such as art fairs, many colorful displays and animated presentations. Retail work is quite a different animal because the hours can be challenging, but as in any endeavor, there is always fruit to be garnered or collected. I went back to teaching at some juncture, but I did work at two other bookstores in that area. Seeing the smiles of satisfied customers or having the joy of wrapping up their choices during the Christmas season was fulfilling in itself. I met people from all walks of life and laughed with staff that looked to humor when things became a bit too stressful. Bookstores are unique places that are becoming increasingly harder to find. I know that the UK and Ireland will appreciate the money donated by James Patterson for the independent bookstores. I recently traveled to a Barnes and Noble bookstore and it was refreshing to have time to browse and make selections. I did not have any particular titles in mind, but two books seemed to be calling my name. I am currently enjoying a book called Perfect Peace, by an author that is new to me. The ability to browse helped me leave with this new prize. Ordering online is a quick and convenient way to get my hands on a book, if I know what I want. But if I really want to pick up a book, handle it and read the blurb, I need to enter that actual space of a bookstore. I have recently read a host of e-books and I like using my Kindle and Nook apps, but a bookstore is like a library. Virtual space is fine but absolutely nothing takes the place of being in a building with shelves of books. The smaller and independent bookstores have an added flavor because each has its own unique character, personality and ambience. Some very creative spaces are being funded through Patterson’s donation. “There are some really exciting projects that this money will help get off the ground, from converting a van into a mobile school bookshop to running a model train around the shop to get kids engaged” (Shaffi). Kudos to James Patterson! He is helping to keep those browsing spaces alive and well! I am the one that remembers the dates of our family members’ birthdays. Even the extended family. Why? Because my birthday is very important to me. That day is exclusively mine. I think of the children at the schools who often wear crowns or tiaras on their special day. Many times, the crowns have been made out of construction paper by the hands of some loving teacher. Birthdays. 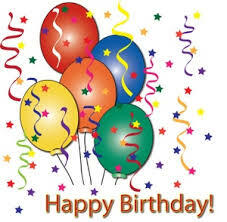 This is a time for celebrations because we have been graced with another year of life. When we see so many of our family members and friends passing on, we learn to take nothing for granted. Another year added to the tick count is truly a blessing. In my family, five out of six people were born in the month of September. Mine comes first. This year, me and one of my sisters went out and listened to a live band. They sang and played music that we grew up on and we really enjoyed ourselves. As many of the songs took us back down memory lane, I danced in my seat. Next, my father’s birthday came and I spent it in quiet reflection as I worked on a writing project. He would have liked seeing me focused. This would coincide with his strong work ethic and innovative thinking. 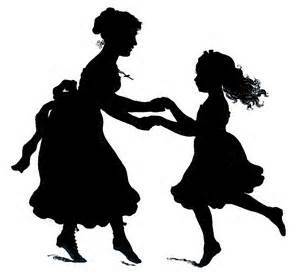 In Paule Marshall’s Praisesong for the Widow, Avey, the main character sees some of the elders in a shuffle-like dance which was a form of ritual and healing. “She remembers the jubilant Ring Shouts she and her great aunt would watch from across the street, and the people did as they shouted their praises” (Praisesong for the Widow-Summary). Later, Avey joins in the dance. She realizes that she needs to heal after the recent loss of her husband.“She goes, and is so nurtured and welcomed, so nursed out of her pent up pain, that she rediscovers her ability to dance, and in so doing, reconnects with her own lost heritage, dedicating herself to passing it along to her own descendants, just as her great aunt had passed the stories on to her” (Praisesong for the Widow-Summary). Birthday celebrations are truly rites of passage. A birthday allows us to look both ways down the avenue of life. We can look back to where we have been or we can look forward to where we are ready to go. My oldest sister’s birthday is the last family celebration of the month. I took a short trip to spend time with her. We put candles on a cupcake and allowed her to blow them out. She also played a variety of music from her bed and I danced. I relaxed and entertained at the same time. We both rejoiced during our rites of passage as we creep up the numerical ladder in age. She had creatively posted these words on her wall. “Life isn’t about waiting for the storm to pass. It’s about learning to dance in the rain.” This spoke volumes to me and I decided to tweet those words, as well. This September, I have decided to claim the entire month as my celebration month. I have danced, shopped and traveled. I even attended a ballet which is one of the most exquisite forms of dance. Birthday bashes are nice during those years when all things fall together. But, a birthday is a birthday whether it is spent in quiet reflection or out amongst others. They mark new beginnings and remind us of how special we are to our loved ones. We can see how far we have come, as we look ahead expecting more new and wonderful things in the future. Sometimes we have to settle the score. When unpleasant events arise, and they will, we must first settle the score within ourselves. Once the hurt, inner turmoil and turbulent emotions have been faced, we have a better chance of putting those feelings into a safe place of finality. I often journal about things, people and situations that unsettle me. It helps me tremendously. Lord Byron wrote, “If I don’t write to empty my mind, I go mad.” Diaries and journaling can be great aids for self- analysis and self-awareness. Talk with the conflicting source, if possible. Talk with someone objective about the situation. Listen to what our inner voice is saying and learn from it. Stay with the problem, until we feel that it is really settled. Sometimes, we do not know why we feel what we feel. We just know that something is eating away inside and that something has rattled us. Like a chest of drawers, we must pull open the drawer and take a look at what is inside. When that drawer is wide open, we can speak honestly and say, for example, ‘When this situation occurred, I felt betrayed, deceived, unappreciated or disrespected.’ We can acknowledge what caused the stir down in our souls and the healing process can begin. Once we have faced those dark emotions, we can start flipping on the light to hopefully ‘shoo’ those hurtful or angry feelings away. “It is better to light a candle than curse the darkness,” Eleanor Roosevelt reminds us. We can decrease the big “I” to a little “i” which will take away some of our self-importance. New and more refreshing thoughts will emerge that will uplift and benefit us. If something has ‘floored us,’ we must get up off the floor. If someone who we thought we knew, shocked us, we must understand that we did not really know that person. People wear layers of masks. Finally, settling the score is our responsibility. We must face what has occurred, look at it, evaluate it, soak it, soap it, and wash it. Like a set of sheets, we can then hang them out to dry. When they are dry, we can take them down, shake them out, fold them and neatly tuck them back into the chest of drawers. Close it gently, let it go and move on, knowingly. Have you ever felt that it was time to settle the score regarding some situation? 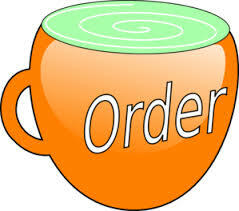 Order is the word used for the month of September for followers of the Unity Movement. More specifically, it is called ‘divine order.’ They are the creators of the small guide called, Daily Word. My mother introduced me to this small booklet at an early age and reading it has been a part of my morning ritual ever since that time. As an educator, this time of the year reminds me of ‘getting back to basics.’ This is when we attempt to rein in the children after a long summer of unstructured play. It is a time when bells ring to signal where we should go and at what time. That order is built around a carefully planned schedule. “Order” is what the judge shouts when the courtroom is about to fall into chaos or anarchy. He or she pounds the anvil to bring things back under control because little can be accomplished without a level of systematic order. Some refer to it as ‘getting our ducks in a row’ and following some design. Each day, I create a ‘to do list.’ I only write conceivable goals and I strike them off as I complete each task. For example, I would never say, write four chapters today. But, I might say, write one chapter today and two might roll out, if the energy around me is right. Anything that I do not accomplish on that day will be moved over to the next day’s list. Highly successful people have plans which are normally written down for the sake of remembering. We get thousands of interruptions within a day, so a written plan is essential. One text or email can easily take us far from our goals, but the written words bring us back into focus. Order requires organization. When I sit down to write or grade papers or start on any task, I make sure that I have all of the tools I need to complete that task. Every time I get up to get some item, that is time taken away from the task and I usually set a span of time where I work straight through without stopping. I might say, okay, I will work for two hours before I take a snack break. I also mute the phones because an unexpected phone call or text can destroy a work schedule. Once the concentration is broken, there is a chance that I cannot get back into the zone nor back on task. Yet, once that task is completed, I make it a point to keep order by putting everything back into its own ‘home.’ I put away the pens and the paper or whatever I am using for that endeavor. I also clean off my desktop by putting things into their proper folders. As the saying goes, “Out of sight, out of mind.“ Once something has been accomplished or completed, the mind is free to move on to the next phase or project. This brings me the latter part of Franklin’s quote where he writes, “…let each part of business have its time.” This reminds me of my book, A Golden Leaf in Time Revised where the two main characters, Trey and Phoenix, have allowed the carnage of their individual love lives to negatively affect their jobs. I have seen careers suffer because there was no clear separation between family and jobs. Some families call the jobs all day and several employees have taken way too many personal issues to work. I am guilty of this as well. As Mandino suggests, there needs to be a line of demarcation between the two. Then, order and real fulfillment can be experienced. However, after a lot more maturity, a planned and organized work schedule and an understanding of keeping the family and the marketplace separate, we can truly bring more order into our lives. As Woody Allen’s saying goes, “If you want to make God laugh, tell him about your plans.” So, the bottom line is whatever we plan, things are subject to change. The word, CONTINGENT, should forever be sketched in our psyches. So, I prepare to go and answer the call. When we give, we receive bountifully. It may not come right away and it may not come from the source to which we gave, but it is certainly coming. We reap the fruits of our labors and I have seen it time and time again. However, we do not give to get or receive. We give because there is a need to share our gifts and talents with others. They say, if you do not use it, you will lose it. Every time we leave our homes and comfort zones and interact with others, there are always chips of gold to collect along the way. And we get to cash these chips in at a later date for our own personal uses. As a writer, I look at this venture as an opportunity to retrieve a host of new story ideas. People are always telling their tales in an effort to replenish themselves or to put some dilemma into perspective. They are simply trying to put themselves back together again or to get a new lease on life. All people have a need to connect and share experiences. Many know that it is often safer to tell their woes to a stranger as opposed to some fair-weather friend. Then those sacred secrets will not end up on the rumor mill. When shared with a totally objective person who does not know the players involved, there will be no whispers or echoes. There will be no reverberations blowing in the wind or exaggerations of the actual account. Sometimes when there has been a great loss, we jog because the pain might catch up with us. And the pain can be so excruciating. But after we finish running, we turn and face the lion on the pathway. And so this brings my turning and facing the loss of Whitney. It has been over two and half years and I now face the lion on the path. I was watching The Preacher’s Wife last week though it is not yet Christmas. I simply enjoyed watching the movie and mostly getting a chance to see Whitney again, in all of her glory. Then, the movie came on again the other night on Oxygen and I sat down and really watched it more closely. Just as in the movie, the theme centers around taking our precious commodities for granted. A husband and wife have fallen into a slump and it takes the appearance of Dudley, the angel, to help reawaken their love for each other. How timely! So many times, we take our stars, singers and beautiful gifted ones for granted expecting them to always be there. However, we are only blessed with their earthly presence for a season. But, this post is all about Whitney, our precious angel. It is interesting how the gods seem to make the stars beautiful both physically and in talent. She was a beautiful woman who could wear an evening gown like no other. As one phrase goes, she was ‘pleasing to the eye,’ and was showcased to His glory before millions. Whitney put the “E” in elegant. As I continually thought about Whitney, I remember the soundtrack from The Preacher’s Wife. My mother had that CD at the time and played it regularly. It was one of her mantras. I especially remember, the cut, “I Love the Lord; He Heard My Cry.” Fortunately, I could go to the Internet and listen to it again. I was reminded of a recent conversation with a musician friend who was grieving over the loss of keyboardist, Joe Sample. We both agreed that we are so lucky to have U –Tube and other electronic recordings to relive those notable moments that these artists have left behind. Also, I went to Best Buy in hopes of getting the soundtrack from The Preacher’s Wife. They did not have it. But, instead, I left with her first CD called Whitney from 1987. I left feeling a little disappointed but when I got home, I discovered that it was her first album and realized that I had gotten a piece of gold for an inexpensive price. Her spirit touched mine as I sat in the car at the lakefront and listened to this CD from the beginning of her career. The songs that truly touched me are: Didn’t We Almost Had it All; For the Love of You and Where do Broken Hearts Go? She closes with a duet with her mother Cissy Houston, I Know Him So Well. One cut that did not make it big from the album is Where You Are. I liked it though I cannot say I heard it on the airwaves during her debut days. It was a great revisit with the younger Whitney and it made me think of my journey during her lifetime. Musicians do set the soundtrack for our lives and we can remember exactly where we were and what our mindsets were during the time that those songs were popular. There are so many memories of Whitney. The songs, the movies and oh just so much! When she was Brandy’s fairy godmother in Cinderella, it was quite apparent that she had a heart of gold and I miss her. I really miss her. In 2012, when she left us, there was such a lump in my throat. All I could do to cope is, as I opened by saying, simply keep jogging in my mind. Try to accept it and keep on moving. 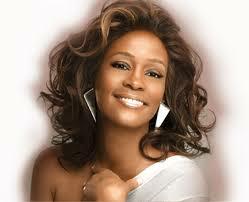 One night, I was having a difficult time and I heard Whitney singing, I Look to You,” all night. It was as if she was serenading me and I felt comforted as her soulful voice rendered solace and peace. Now, our precious commodity, Whitney is an angel looking out over us and with a protective wave of her magic wand, she is still bringing joy and comfort to those of us who love her. All we have to do is turn on the music and feel her still standing close by in a long, exquisite evening gown. The other day, as I was driving through the heart of the city, I noticed a group of young adolescent boys playing football. It was a refreshing sight! I was tempted to pull over and just watch for a while, but there was no immediate place to park. But my heart lingered behind as our boys were suited up in football gear and helmets as they took the field. As an educator who is crucially aware of the inner city plagues, it warmed my heart to see these positive images in spite of the daily fears for our youth. My thoughts also ventured to the parents who silently drive their children to these events and strive to pay whatever fees. They truly work hard to give their children an opportunity to have some viable outlets and avenues in life. I thought briefly of one of my nephews who played little league as a child. As an adult, he currently works in the field of sports and has done so for years. Those childhood experiences helped to shape him and positively affected his career choices. And that leads me to our latest victory this summer. We are still reveling in the success and joy that our little leaguers, the Jackie Robinson West, brought to the city. The boys were gracoius and did not disappoint us as an all-American American team of 13 boys, aged eleven to thirteen. Rarely do we get a chance to showcase our youth in such a wonderful light, but we educators know that there are many great children existing and thriving. This team, led by Coach Darold Butler, made us proud as a city. The children were not only good on the field, but they had been trained and were well-versed as they handled the media and public. It brought warm, fuzzy feelings to many of us. They became the National Champions and the City of Chicago pulled out all of the stops in acknowledging their achievements. They had a victory ride on tourist buses through the city and ended up in the renowned Millennium Park. There were over 10,000 people present to cheer them on. Later, there was a fireworks show in their honor, thanks to the City’s mayor. Also, the field where they currently practice is due for a $6.5 million upgrade in the near future. The White Sox allowed them to sport their 2005 World Series trophy for a while. They were also allowed to ‘stand with the players and the sing the National Anthem before the White Sox took on the Detroit Tigers’ at U.S. Cellular Field (Madhani, Aamer. ‘Little Leaguers still knocking it out of the park.’ USA Today- September 4, 2014). The Cubs gave them time on their Wrigley Field and gifted them with ‘specially made Jackie Robinson warm-up jerseys’ (Madhani). There have been monetary gifts and they recently returned from a weekend at Disney World. These experiences will stay with these young men for the rest of their lives and they have brought so many smiles and happy tears to our city and certainly to the African American community. When the southerner uses the phrase, ‘that is high cotton,’ it means that someone is playing with the big leagues or in the company of those with great influence. Well, our boys had this wondrous experience and it brought pride to our city and further united us. This pre-teen age group can be one of the most challenging because we often do not know how to reach them when they are angry and full of angst. So back to the old child development rules, play not only works, it adds balance to a child’s life. According to psychologists, play helps them with social competence and emotional security. Some writers spend extended amounts of time on settings and scenic descriptions. That is a true luxury for those with plenty of time to write, create and truly color the images and scenes. We working writers have the will to write but must do so after a 9 to 5 or in between breaks. Therefore, the descriptions of images and scenes are somewhat limited. However, I would like to share three scenes filled with imagery and see if they meet the goal of developing a pictorial image in the mind of the reader. 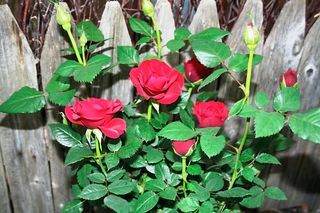 First, we see Phoenix’s aunt’s beloved rose bushes from A Golden Leaf in Time Revised. Phoenix is able to forget her current concerns as she listens to her aunt’s melodious voice describe her garden. It shows how the aesthetics of nature can calm the soul. In another scene, Phoenix drives from the impoverished neighborhood where she works to a more affluent community where she resides. She makes this drive daily and the reader gets a sense of the change in scenery as she heads home, closer to the center of town. Some writers write detailed descriptions of landscapes almost to a fault. If I had the time to write a long work of fiction with 300 to 500 pages, I would still limit my time spent on scenes and imagery. I would not want to put the reader to sleep. I want to activate their imaginations because to me, reading is personal. Readers have their own painted images in mind of how things look as they read a literary work. Sometimes, when books become movies, some of the imagination is distorted because the reader may have imaged a scene or person one way and the script and actors give it another. Yet, that is a discussion for another time. In one last scene, we see Trey running on a jogging path at the pace of a mad man after a heated argument with his girlfriend, Flora. “He threw on his jogging suit and running shoes and took an extra jacket. Though the weather was brisk, he took the elevator down, walked over to the lakefront, and broke into a breakneck speed as though something or someone was chasing him. He ran and ran until other more regular-paced joggers looked at him as he passed. They could detect that he had the momentum of a person with a problem. He did indeed!’…. How many women have looked in the mirror and exclaimed, “Wow! I have become my mother!” I have seen my handwriting look more and more like my mother’s, along with some of my gestures and facial expressions that remind me that I am my mother’s daughter. Mothers and daughters have a special bond and through its myriad stages, the tie is always bound by a deep and abiding love. Two books come to mind that have helped me along the way on this subject which are Nancy Friday’s My Mother, My Self and Alice Walker’s In Search of Our Mother’s Garden. Both books gave me alternate ways of viewing mother-daughter relationships. These loved-filled relationships can also have periods of contention during power struggles. Adult daughters of aging mothers know that their roles gradually reverse and the daughter may become the parent. But the aging mothers will not ‘go quietly into the night,” and wars can ensue. However, in both of my novellas, the mother is still administering the comfort and solace to her daughter. In A Golden Leaf in Time Revised, Septima comforts Phoenix after she takes a day off from work and is resting at her mother’s sister’s home. After the aunt has said and done all that she can, Phoenix calls her mother long distance. Her mother advises her. In the sequel, Warm Intrigues, Septima and Phoenix are now living in the same city. They are close and the mother notices the positive changes in her daughter once Phoenix is dating a new guy. “Her mother walked around the one-bedroom place and showed an approving bow of the head. “Nice. Really nice. Nice view and lots of sun which matches your disposition,” she said. “Well, thanks, Ma. That is a compliment. A real compliment,” she added. “I thought that the sun had left, but it has come out again,” she said. Alice Walker writes, “My mother had handed down respect for the possibilities…and the will to grasp them.” Of course, Septima wants the absolute best for her daughter and is quite happy to see her being restored to her natural state of beauty. Phoenix looks at her mother in another scene and privately hopes that she will be like her mother when she is older. She comments on her mother’s fashion choices. small low-heeled boots, and a nice camel-colored cashmere wrap. The bond between mothers and daughters is eternal. Even if our mothers are no longer physically present, we still feel them hovering and protecting us. All of those wonderful images of her during her earthly existence are forever etched in our memories and psyche.